first a build a wim.boot with with standard as bootmanager. as result i get an .iso, with no bootmenu booting directly win7pe_se into ram (boot.wim). after that, i create a nother project with direkt-boot (no boot.wim). after winbuilder is finish with this, i change it to multiboot and grub4dos again. (the first createt wim.boot-win7pe.iso wich boot into ram and other isos). then create menu.lst and put it to the compilation. if i now going back to the script "create-iso", i can create my own multiboot-iso-compilation. so i have an project with two windows7: one that boots direct and needs not much ram and one wich is direct booting into ram, wich needs much ram, but its faster if its loaded. this is the only working way i found out, to build a projects wich works on every machine:; computers with low ram and computers wich much ram. i put also other isos into /Boot/IMG. the problem is now, if i put much isos in this folder so the createt iso is over 4gb big, then the createt direct boot windows7.iso (not bot.wim) on my iso-compilation, isn t working correctly anyore. i get an message like: "winload.exe was not found or corrupt". if i reduce the size of the final iso to 4gb or lower, then everything is working correctly. but i need to find a way to have this two windows7 on my iso-compilation and the compilation should be bigger then 4gb. otherwise it make no sense for me becouse i can t even use the full space of an normal dvd and from a double layer i will not even talk. it would be nice, if anyone of the experts here, can help an not so experienced enduser with esay instructions to solve the spoken problem. Edited by livedude, 09 April 2012 - 05:06 PM. Other ISO images are sorted at end of media that way. This may solve the sort layout issue or not. Issue haven't arised in VistaPE or Win7PE before. There is no solution described so far. Does help above work around? Which parts do you include to DVD? Can you upload the menu.lst file? Most end user use a USB mass storage drive nowadays. A DVD is used seldom nowadays. May I ask: why do you need a DVD/Blu-ray? just tried it. no luck, still the same problem. as soon as the iso gets bigger then 4gb, then the message apear: winload.exe not found or corruptet something and an error code. Issue haven't arised in VistaPE or Win7PE before. and several other files like menu.lst are also in it. maybe be later if i have clear instructions/informations. of course. every computer with an cd/dvd/bluray-drive, can also boot from it, but long not all computers with usb, can also boot from usb! respective older computers (but also some of newer ones) can t boot from usb. my project should run on as many computers as possible, for diagnostic, recovery and so on purpose. Edited by livedude, 09 April 2012 - 11:09 PM. One alternative would be to make just ONE win7PE...but use the switches on the individual tools to put some things "in" the Ram disk image (boot.wim) and leave others on the "CD"...There is a global setting that sets a default, but there are settings on many of the application scripts. That is just one example. Then you could have a relatively small boot.wim file that runs from RAM, but that accesses programs on the physical CD. My guess is that somehow the WINLOAD process doesn't like a file system >4Gb...But I'm sure others may also chime in. i already do this this way. but the createt boot.wim needs to much ram, at least 700 till 800mb. and there are also some apps you can t run from cd/dvd, becouse they need write-axces. for example anti-virus-programms like avira, wich update their virus-defenitions. Edited by livedude, 10 April 2012 - 01:50 PM. Instead of bootIMG, try putting your "other .iso's" in zootIMG (not in bootzimg). This will move the folder at the end of the build. Which specific tool are you using to create the DVD? If yes, with which specific command line? (please post it). Thank you Wonko for helping! i tried it, and it seems to work. createt iso is about 4.5gb big and win boots without this winload.exe corrupt or not found message. till now it looks good, but to be sure that it really works, i must make some further tests, as soon as i find the time. yeah, Scott and i also thought that it has something to do with the winload.exe. good to know. 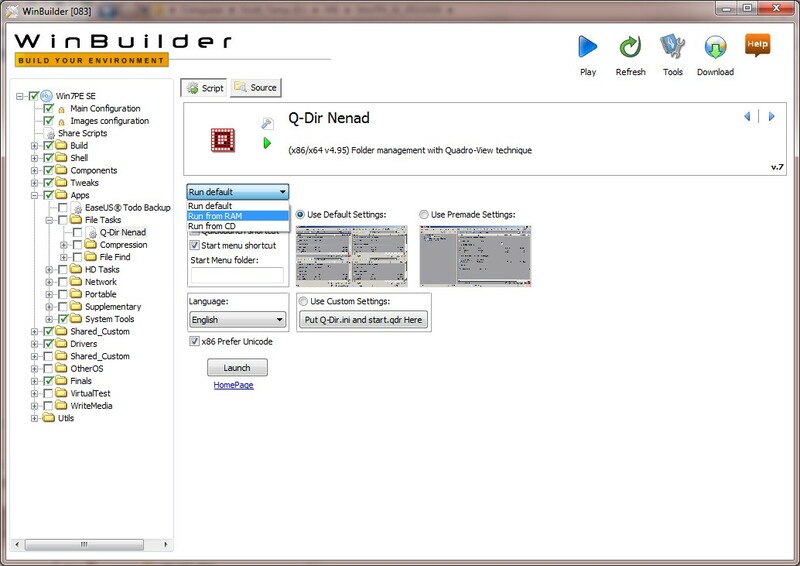 after bulding the project with winbuilder and after i inject my isos, i use the "create-iso"-script to build the dvd. i use the fixed version of mkisofs from ChrisR: Thank you again for this Chris! sorry, i can t answer that, becouse i use the commandline that create-iso-script has implementet. if it helps, i can also upload this script that you can take a look. but i think this script is known and it comes with several projects. i use the one from the project; Win7PE_SE. Edited by livedude, 10 April 2012 - 03:50 PM. no luck, still the same problem. as soon as the iso gets bigger then 4gb, then the message apear: winload.exe not found or corruptet something and an error code. Which LBA goes to winload.exe? IsoBuster free does display the relating LBA. Of course other conditions may relate winload errors too. A flat file PE1 with setupldr.bin reads first 4 GB at optical media. Given menu.lst contains windows and *nix parts. Different opeating systems prefer different file systems at optical media. It's difficult to select the proper combination. This limits possible file system and file extensions. Do you use reliable DVD drives? Do you use reliable double layer reading DVD drives? Does this limits to single layer DVD? Do you use double layer DVD media? Do you use a Blu-Ray media? What about several boot media? Naah, what might help is if you open the .script and read the actual mkisofs command line in it and post it. (this way you will also understand how there is no particular "magic" in a .script, only a sequence of commands, and if needed, you will be able to change those commands). i hope so:) its a normal 20 euro dvd-writer i use. atm i am useing single-layer dvd`s, but later on i will expand my project to double layer dvd`s. no, becouse it makes no sense atm. bluray-medias are still to expensive. maybe i will use them later if the prices drop to an aceptable level. not an good idea, becouse i want to have one optical media for all purpose and not different media`s for different purposes. Yes Sir:) but before i can do this, i must first know, wich of all the content from the script, are the mkisofs commandlines. ShellExecute,%Show_mkiso%,#$q%Tools%mkisofs.exe#$q,"-iso-level 4#$s-force-uppercase -volid #$q%Volume_Name%#$q -b #$q%BootSect%#$q -no-emul-boot -boot-load-size 8 -hide boot.catalog#$s-duplicates-once -o #$q%ISOfileVar%#$q #$q%targetdir%#$q"
If,Not,%BootSector%,Equal,"IsoLinux",ShellExecute,%Show_mkiso%,#$q%Tools%mkisofs.exe#$q,"-v -iso-level 4 -l -J -joliet-long -R -volid #$q%Volume_Name%#$q -A #$qGRLDR/MKISOFS#$q -sysid #$qWin32#$q -b #$q%BootSect%#$q -no-emul-boot -boot-load-size 4 -hide boot.catalog -duplicates-once -o #$q%ISOfileVar%#$q #$q%targetdir%#$q"
Else,ShellExecute,%Show_mkiso%,#$q%Tools%mkisofs.exe#$q,"-v -iso-level 4 -l -J -joliet-long -R -volid #$q%Volume_Name%#$q -A #$qGRLDR/MKISOFS#$q -sysid #$qWin32#$q -b #$q%BootSect%#$q -no-emul-boot -boot-load-size 4 -c isolinux/boot.cat -boot-info-table -duplicates-once -o #$q%ISOfileVar%#$q #$q%targetdir%#$q"
thank you, but i already know this;) its only a thing of the right commandline, syntax and stuff. so thx again, till now everything seems to be working. if i find the time i re-check everything again and respond. Edited by livedude, 10 April 2012 - 05:16 PM. The easiest way is to look into the log.htm. The executed line is NOT greyed as 'skipped', and the big advantage of the log is, that all variables like %Show_mkiso% are resolved. Yep , but the idea is that you quickly become expert yourself . ShellExecute,%Show_mkiso%,#$q%Tools%\mkisofs.exe#$q,"-iso-level 4#$s-force-uppercase -volid #$q%Volume_Name%#$q -b #$q%BootSect%#$q -no-emul-boot -boot-load-size 8 -hide boot.catalog#$s-duplicates-once -o #$q%ISOfileVar%#$q #$q%targetdir%#$q"
If,Not,%BootSector%,Equal,"IsoLinux",ShellExecute,%Show_mkiso%,#$q%Tools%\mkisofs.exe#$q,"-v -iso-level 4 -l -J -joliet-long -R -volid #$q%Volume_Name%#$q -A #$qGRLDR/MKISOFS#$q -sysid #$qWin32#$q -b #$q%BootSect%#$q -no-emul-boot -boot-load-size 4 -hide boot.catalog -duplicates-once -o #$q%ISOfileVar%#$q #$q%targetdir%#$q"
Else,ShellExecute,%Show_mkiso%,#$q%Tools%\mkisofs.exe#$q,"-v -iso-level 4 -l -J -joliet-long -R -volid #$q%Volume_Name%#$q -A #$qGRLDR/MKISOFS#$q -sysid #$qWin32#$q -b #$q%BootSect%#$q -no-emul-boot -boot-load-size 4 -c isolinux/boot.cat -boot-info-table -duplicates-once -o #$q%ISOfileVar%#$q #$q%targetdir%#$q"
ShellExecute,%Show_mkiso%,"%Tools%\mkisofs.exe","-iso-level 4 -force-uppercase -volid "%Volume_Name%" -b "%BootSect%" -no-emul-boot -boot-load-size 8 -hide boot.catalog -duplicates-once -o "%ISOfileVar%" "%targetdir%""
If,Not,%BootSector%,Equal,"IsoLinux",ShellExecute,%Show_mkiso%,"%Tools%\mkisofs.exe","-v -iso-level 4 -l -J -joliet-long -R -volid "%Volume_Name%" -A "GRLDR/MKISOFS" -sysid "Win32" -b "%BootSect%" -no-emul-boot -boot-load-size 4 -hide boot.catalog -duplicates-once -o "%ISOfileVar%" "%targetdir%""
Else,ShellExecute,%Show_mkiso%,"%Tools%\mkisofs.exe","-v -iso-level 4 -l -J -joliet-long -R -volid "%Volume_Name%" -A "GRLDR/MKISOFS" -sysid "Win32" -b "%BootSect%" -no-emul-boot -boot-load-size 4 -c isolinux/boot.cat -boot-info-table -duplicates-once -o "%ISOfileVar%" "%targetdir%""
"%Tools%\mkisofs.exe","-iso-level 4 -force-uppercase -volid "%Volume_Name%" -b "%BootSect%" -no-emul-boot -boot-load-size 8 -hide boot.catalog -duplicates-once -o "%ISOfileVar%" "%targetdir%""
"%Tools%\mkisofs.exe","-v -iso-level 4 -l -J -joliet-long -R -volid "%Volume_Name%" -A "GRLDR/MKISOFS" -sysid "Win32" -b "%BootSect%" -no-emul-boot -boot-load-size 4 -hide boot.catalog -duplicates-once -o "%ISOfileVar%" "%targetdir%""
"%Tools%\mkisofs.exe","-v -iso-level 4 -l -J -joliet-long -R -volid "%Volume_Name%" -A "GRLDR/MKISOFS" -sysid "Win32" -b "%BootSect%" -no-emul-boot -boot-load-size 4 -c isolinux/boot.cat -boot-info-table -duplicates-once -o "%ISOfileVar%" "%targetdir%""
As well it would be possible (depending on the settings you chose) that one or the other command line has been executed and this may make a difference (it doesn't in this particular case). As pscEx correctly pointed out, the actual command executed will be recorded in the the log, but you also need to understand where it comes from, should it be needed for tests to change it or should you want to try re-creating a .iso manually. Thanks to jaclaz for clarifing. Yes, if i suggest /zImg/ then /zImg/ is assumed to be used. It's sufficient so sort all textmode PE boot files below first 4 gb. but later on i will expand my project to double layer dvd`s. Be careful: there is no operating system error correction at boot. Old used DVD drives dosn't read double layer dvd's reliable in my experience. I prefer CD-RW at old drives. Where to find a log.htm? There are log_%date%_%time%html at Win7PE. Any special configuration to set? I get non resolved variables. Setupldr.bin is limited to first 4GB too. Seems so far: haven't changed in bootmgr. It's more a crude work around. The sort approach is integrated in UBCD4Win. Sort approach seems to be forgotten in the past. And a boot floppy, because BIOS dosn't boot from a CD drive. WinBuilder creates the standard log.html (Sorry about the missing 'l' in my post). Every other logs which may fill the hdd with unnecessary garbage (when the user does not delete them sometimes), are built by the individual projects when using the "log timestamp" option. Maybe there are some volunteers to scan all forum's posts and add this information to all places where only "log.htm[l]" is mentioned. Maybe the unresolved variables are the real reason for the issue reported here. In a ShellExecute[Ex] log line there should only be the unresolved variable %BaseDir% which is explained in the beginning of log[_bla_bla].html. @cdob: Please list the unresolved variables here which you found in your test. There dosn't exist a log. * file after full run. Win7PE_SE seems to rename the file. Yes, that's it. %BaseDir% is not resolved, but all other variables. Thanks for clarifing. In addition I wonder: which current working directory sets ShellExecute[Ex]. Does it change to %BaseDir% first and call application next? Does it use system default (e.g %Systemroot%system32)? And another: can ShellExecute[Ex] grab a console output, a error output and read a ErrorLevel? mkisofs.exe -v -iso-level 4 -D -r -joliet-long -volid "Win7PE" -sysid "Win32" -b "isolinux/isolinux.bin" -no-emul-boot -boot-load-size 4 -hide boot.catalog -duplicates-once -o "C:Win7PE_SE_SmallISOWin7PE_x86.ISO" -A "Syslinux/MKISOFS" -boot-info-table -o "C:Win7PE_SE_SmallISOWin7PE_x86.ISO" "C:Win7PE_SE_SmallTargetWin7PE_SE" "C:Win7PE_SE_SmallWorkbenchCommonRootCD" 2>&1|mtee.exe /+ "C:Win7PE_SE_SmallTempWin7PE_SEmkISOlog.txt"
if ErrorLevel 1 echo Error %ErrorLevel% > "C:Win7PE_SE_SmallTempWin7PE_SEmkISOerr.txt"
Idea: incldue the mkisofs output to the log.html, if a ErrorLevel greater equal 1 occurs. verified, the z-folder-method seems to work. atm i am at a size of 4.5gb and everything works fine. this scripting/syntax stuff is strong tabaco for me:) bevor i understund that, i must read the basics. its a hobby project. i try to make an all in one solution live-system for the most needs and cases. i am very pleased with the result i have now and learned much about winbuilder and that stuff. i hope the z-folder method will keep working if i extend the size of the project. lets see. Thank you very much guys for your help. i am impresed from all the knowelgde and competence here! Edited by livedude, 10 April 2012 - 09:48 PM. WinBuilder does not set the working directory when it starts the child process. Sorry, any consol output cannot be grabbed. When a script wants to check an output, it has to redirect to a file and check the file. ShellExecute causes the variable %ExitCode% to be filled with the exit code of the child process. This variable remains until a next ShellExecute. As ShellExexuteEx does not wait for the process, here the value of %ExitCode% is not set. Why then not redirecting the output of mkisofs to a file, say mkisofs.log (or directly to the main log)? Sure, especially in the case of mkisofs the "-log-file" option can be set in the script. But that's a question for the project bakers. but this is not the point here. after this critical winload.exe>4gb-problem seems to be solved, i can go on with optimizing my project. it would be nice, to implement that in my project. the win-xp installation over ramdisk, i see only a crude workaround becouse it needs to much ram. i only used this, becouse i don t found an understundable way, how to implement a native xp installation with an untouched iso without ram-disk. then it would also be nice, to have the posibility for an win7-installation implementet in my project. of course also with an untouched win7.iso. this are the two things i am working now. if this should be not possible, i can life with it, but i think, it is. if anyone can give me a helping hand with clear instructions to do this, would be nice. if not, becouse its to much work or something, then its also ok for me. Edited by livedude, 11 April 2012 - 12:58 PM. but this is to unclear to use it for my project. i have already earlier found this instructions, but i don t know how i can use them for my project. you see my menu example how everything is working in my project and how i start iso. for this case, i need the right commands and syntax to implement this to my project. i downloaded the Tut43 file and and i extractet it to WINFira. in the WINFira iso folder i copied my win7.iso. i used the example menue, copied the WINFira folder to my project (target-dir/mainpath) and build the dvd.iso. sure the paths are not fit or something like this. but without clear instrcution oriented to my project, i can t change it. i said how my project is build. you know the target path, you have examples how i start isos and stuff. so all needed information to give me the correct syntax should be there. i don t know what i can do more. thx for help, but without clear instrcutions, i don t think that i can reach this goal. p.s: you can write me also of course a pm on german (that would be at least easier for me to understund), with the correct syntax orientet to my project. Edited by livedude, 11 April 2012 - 02:42 PM. normaly its no problem for me to change such path that they work on my project. set MYISO=win7.iso /uhm nice. myiso. yes this explains all. do they mean maybe: set MYISO=/WINFira/Iso/win7.iso (wich is the path to the untouched win7.iso on my project)? i absoultly don t know what they want from me and how i can change the path that its fit to my project. no way, without clear instrcutions to do it. i have also some experiences and can say that paramters like "map (hd0) (hd1)map (hd1) (hd0)", never ever worked on my project. if i tried to start iso`s with that. i allways get an error message if i use this paramters in vm. i think, without changeing this, that it fits to my project, correct syntac and stuff, its not possible for me, to implement that. Edited by livedude, 11 April 2012 - 02:43 PM.